Beidou bosses have leaked the next generation Beidou Little Pepper 3 will be a 5.7-inch1080HD phone with Tegra 4 CPU and LTE! Oh, they also have plans to animate the Xiaomi Mi3! China is fast becoming the place to look when searching for phones sporting the latest and greatest hardware. The Oppo Find 5 was the first phone to really highlight this, and news that ZTE will be the first Tegra 4 handset maker firmly concretes that fact, however ZTE won’t be the only ones. Beidou have rose to fame after launch the original dual-core Little Pepper last year. Since then they have launch the 5-inch screened Big Cola and Tegra 3 equipped quad-core Little Pepper, but it’s what they have planned for Q3 this year that we are really excited about. 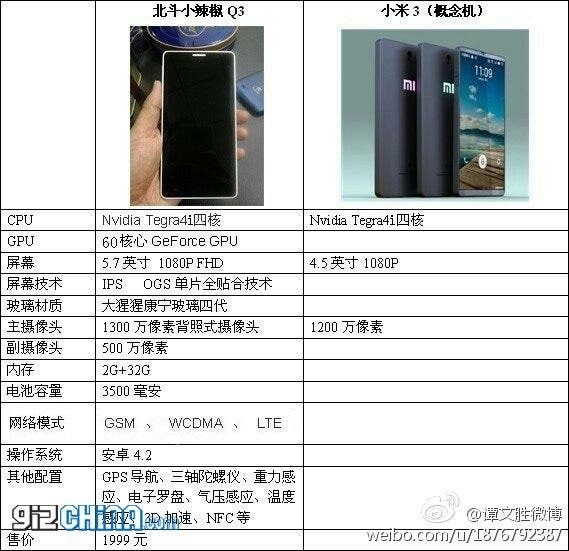 On his official Weibo, the CEO of Beidou, has leaked a comparison table showing the unannounced Xiaomi Mi3 verses the all new and never seen before Tegra 4 powered Little Pepper! We’re going to grab a pinch of salt for the specs as Beidou have made big claims in the past which came to nothing. According to the table, the highlights of the Beidou Little Pepper 3 include a full HD 5.7-inch display, 2GB RAM, Tegra 4 processor, Android 4.2 and LTE support. The new Little Pepper 3 will also boast a 13 mega-pixel rear camera, 5 mega-pixel front, 32GB ROM and NFC all for just 1999 Yuan ($321)! All in all a very exciting phone and one we cannot wait to see in the flesh!